Engineered composite lumber is one of sawn wood alternative. The product described herein utilizes a modified form of sawn lumber as the raw material. 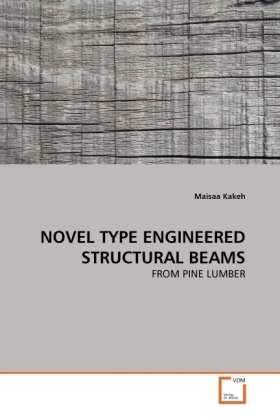 The objective of this research was to manufacture, and evaluate a novel type of engineered lumber by non destructive evaluation and mechanical testing and compare the design values to those published by the U.S. (NDS) for wood construction. Pine logs were into matched symmetrical trapezoids. Symmetrical trapezoids were evaluated non-destructively and sorted by results to be matched into pairs and assembled into Bowtie Beams. Manufactured beams were nondestructively evaluated too. Then the beams were mechanically tested. The design strength and stiffness was compared to the values of sections of equivalent depth and maximum width as shown in the NDS. Also, non destructive test values were compared and correlated to those from the destructive tests. It is found that the mechanically efficient bowtie section produced an increased strength and stiffness efficiency as compared to that of solid sawn material.